Spanglefish includes a convenient system for recording statistics about visitors to your site, accessible through the 'Site Statistics' tab in the control strip across the top of your site. Caveat: Spanglefish doesn't have the large team of programmers and huge budget that Google does, so the statistics provided by our visitor statistics system should be regarded as a guide only - it's by no means 100% accurate - but does offer enough information to meet simple needs. If you want to have absolutely precise tracking of your site usage, then we recommend that you use Google Analytics instead, and your Spanglefish administration system provides an easy way for you to add Google Analytics tracking code to your site. See Site Settings > Site Statistics > Add Google Analytics. 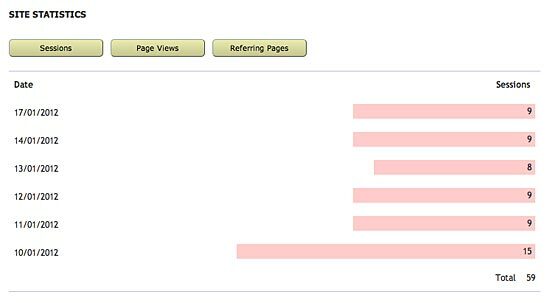 Site Statistics: Click on the 'Site Statistics' tab on the tabbed bar across the top of your site, and you'll see a panel like the one illustrtated above. This gives you access to information about Sessions (the number of individual people who visited your site), Page Views (showing which were the most popular pages on your site), and Referrers (showing which search engines or links visitors used to get to your site). Sessions: This shows how many individual visitors your site has had each day. You should take this as a guide only, as it can be triggered by search engine 'spiders' and 'robots'. However, it can give you an idea of trends. As mentioned above, if you want absolutely precise data for thsi and other visitor ststistics we recommend that you use Google Analytics. 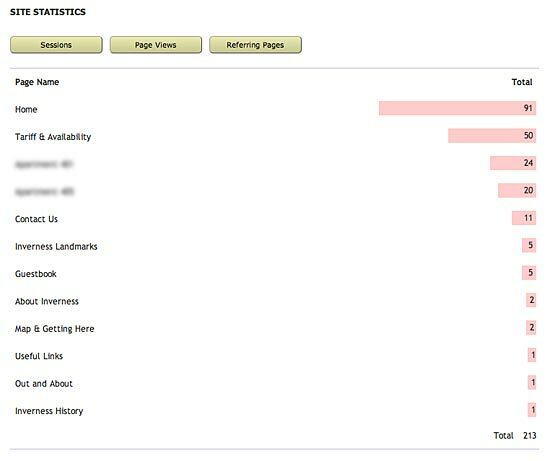 Page Views: this shows the number of visitors that each of your site pages has had, with the most popular at the top. Again, this is a rough guide only and adequate for most users, but if precision is important to you we recommend that you use Google Analytics. 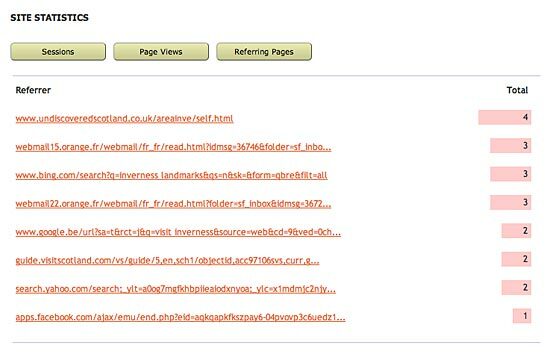 Referrers: this shows which other sites or search engines the visitor used to get to your site, and is a very useful tool. By looking at the statistics here you can see which are the most popular links to your site from other sites, and which search terms have been used on search engines to find your site. Using this information you can see what terms are most popular, and maybe be able to spoot that you have failed to included terms or words in your site that might prove useful in attracting more or better-targeted visitors.